Catelyn Stark: If you lose, your father dies, your sisters die, we die. Robb Stark: Well, that makes it simple then. Catelyn Stark: I suppose it does. Robert Arryn: Mummy, I want to see the bad man fly. Lysa: Perhaps you will my little one. Catelyn: This man is my prisoner. I will not have him harmed. 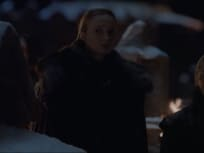 Tyrion: Tell me, Lady Stark, when was the last time you saw your sister? Tyrion: She's changed. She was always a bit touched, but now, you might as well kill me here. Catelyn: I am not a murderer Lannister. Tyrion: Neither am I! I had nothing to do with the attempt on your son's life....What sort of an imbecile arms an assassin with his own blade?